The starting bar has been raised with the Certified Factory Reconditioned Oreck XL Pro Plus IIT. This upright offers an impressive array of new features and sports a bold new look. Like the new ergonomically designed Helping HandR Handle, new hypo-allergenic filtration system, new antimicrobial technology and new, longer warranty. With all these powerful new features, the new XL Pro Plus II will help folks clean like never before all at an incredible value. 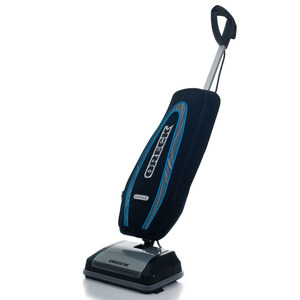 Your Oreck XLR Pro Plus II was designed not only to be powerful for an effortless clean.Its low profile makes cleaning under furniture and other low surfaces a snap.